On January 1, 1989, I started attending church in Palo Alto. Then on Saturday, January 28, I attended an evangelistic meeting in the evening. The speaker was a medical doctor from Hong Kong. My high-tech career successes seemed small compared to his, yet he had felt the same emptiness I was feeling! Facing terminal illness, he had cried out and God gave him double healings. I sobbed when I heard how God restored his relationship with his wife, and how he had written letters to be mailed to his children as they grew up without him. Then someone led us in singing a song I had never heard before, "What a Friend we have in Jesus." The verse "Oh, what peace we often forfeit? Oh, what needless pain we bear? All because we do not carry everything to God in prayer!" That night, I received Jesus as my personal Savior. 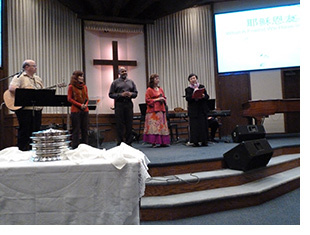 Who could have known I would one day share my story and sing that song with a multi-cultural praise team? As you gather with family and friends, don't forget Jesus is the reason for the season. Without Jesus, I don't know how to live. Jesus gave me a new life and a new marriage. My story is recorded in my article, "Love, So Amazing" that was published by CCMUSA in the April-June 2011 Edition of Challenger Magazine. You can read it here.